This year, a certain breed of salamander in Canada will hopefully be enjoying a safer spring migration. 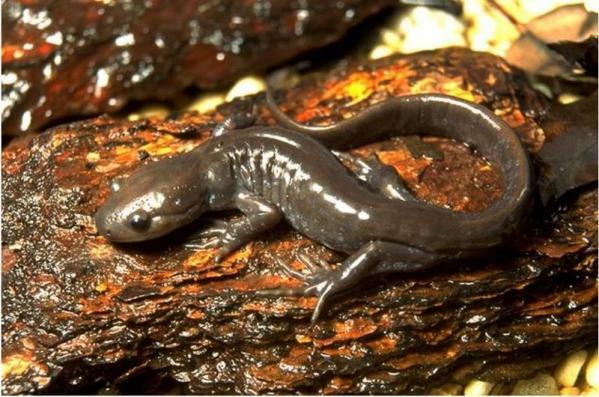 This is because the City of Burlington, Ontario, has closed a portion of King Road in order to protect the endangered Jefferson salamander, Ambystoma jeffersonianum, during its annual egg-laying migration. The Jefferson salamander, also known as Jefferson's salamander, is a North American amphibian, whose range includes the Niagara peninsula of southern Ontario and sections of the northeastern United States. The creature's colour scheme is grey through brownish black on the dorsal side, but with a lighter underbelly. The limbs and flanks may have bluish flecks. Adults may be from twelve to twenty centimetres long, although the tail accounts for about half the total body length. The larvae appear as small adults, except for the fact they are missing the colour highlights and they have gills for breathing underwater. The habitat requirements of the Jefferson salamander seem simple: a deciduous forest with leaf litter, fallen logs or moist but friable soil. However, they also need pollution-free breeding ponds that remain full until at least midsummer, when the larvae lose their gills and adapt to breathe air. These salamanders use "vernal pools", or ponds that arise every spring but usually dry later in the summer.